Despite having the lowest opening weekend of all the other films in The Hunger Games franchise, The Hunger Games: Mockingjay — Part 2 made more at the box office than Creed and The Good Dinosaur. Considering all the talks last week about people having grown tired of the Jennifer Lawrence pictures, it&apos;s clearly doing more than fine for itself. 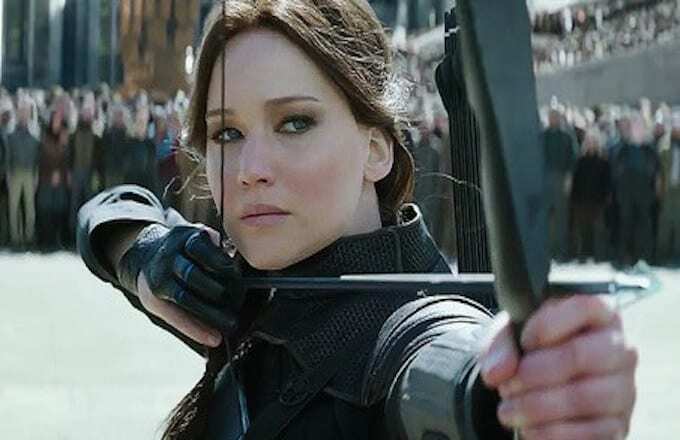 In its second week, Mockingjay - Part 2 made $51.6 million, which allowed it to keeps its place at the top. The Good Dinosaur, the latest picture from Disney and Pixar, made $39.2, while Creed, which is the newest film in the Rocky franchise, followed close behind bringing in 30.1 million. It&apos;s important to note that while it&apos;s Mockingjay — Part 2&apos;s second weekend, it&apos;s only the first for both The Good Dinosaur and Creed. Also worth noting, while Mockingjay - Part 2 may have dropped by 49.7% from its opening weekend, the drop is actually the smallest when looking at first and second weekends of all the films in the franchise. Perhaps this smaller gap means it&apos;ll do a lot better for a lot longer than most expected.